The client was looking to build a casino poker game app, the kind that has not been built before. The mobile app was to be played with a traditional 52 card deck on a standard casino style game table. Titled “Guts Poker”, players on the game played against the dealer and were rewarded if they had the GUTS to challenge the dealer. The game was to built exactly like the one that would be found in a casino with the clear objective of ultimately having casinos actually install the game on their floors. This was a unique requirement for it opened a sea of opportunities. The team needed the app to mimic the exact gameplay of a poker game played on the floor of a casino. The scope was fairly complicated given the various permutations and combinations associated with a poker hand. Animations and graphics were to be top notch to build an immersive game for players. Our in-depth experience in building gaming applications helped us sail through this project. Sound engineers, graphic designers, gaming experts worked like clockwork in conjunction with the development team to build this casino app. We tackled this project like any other challenge with an intent to work, build and produce an app par excellence. The success of this gaming app was unilaterally depended upon understanding, comprehending and executing different game strategies involved in a game of poker. As an example, certain poker hands needed to elicit responses from the game’s animated dealer. We hence immediately started working on the game engine and developing complex algorithms to deliver the perfect product. Engineering appealing 2D and 3D game skins, symbol design, poker table design, game rules etc were all a part of the development phase. We also worked further on the app scope to come up with ideas that augmented the casino game. An integral part of any casino game is the in-game player interaction and compelling background score which adds to the experience. This and so much more was possible through our gaming specialists and experts who only develop games in the casino space. Another major challenge lay in quality assurance and bug resolution. We had to manually play countless number hands on the game to ensure the game logic was absolutely perfect. The need of the hour was to execute an exceptional casino app robust in its coding structure and gameplay. The game also served as a marketing tool for the client with in-app purchases and chips being sold inside the game app. operations, doing way with countless hours of office work. The game has gone onto become one of the most popular Guts Poker game in the market. It has been demoed to various casinos, receiving positive feedback from everyone. 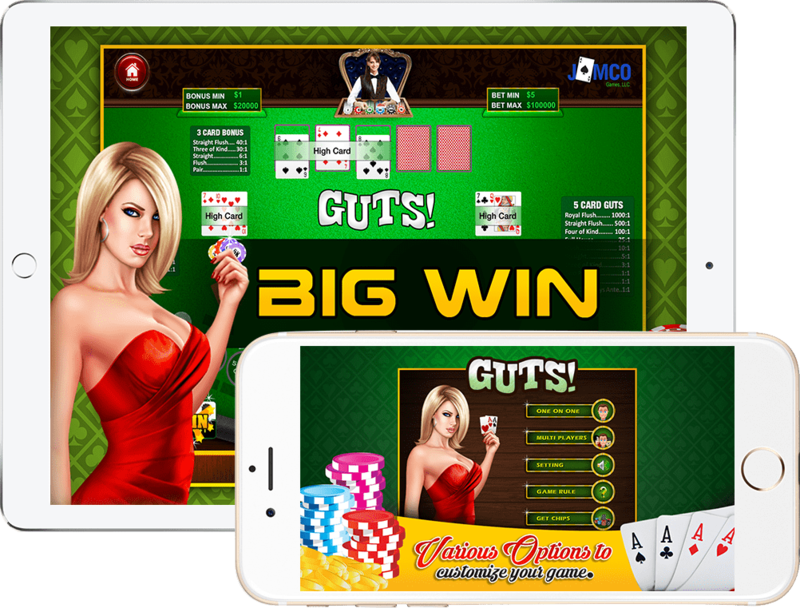 With another gaming app in pipeline for development, the success of Guts Poker only goes onto underline the willingness of RNF Technologies to take up ownership of projects and delivering goods in time.